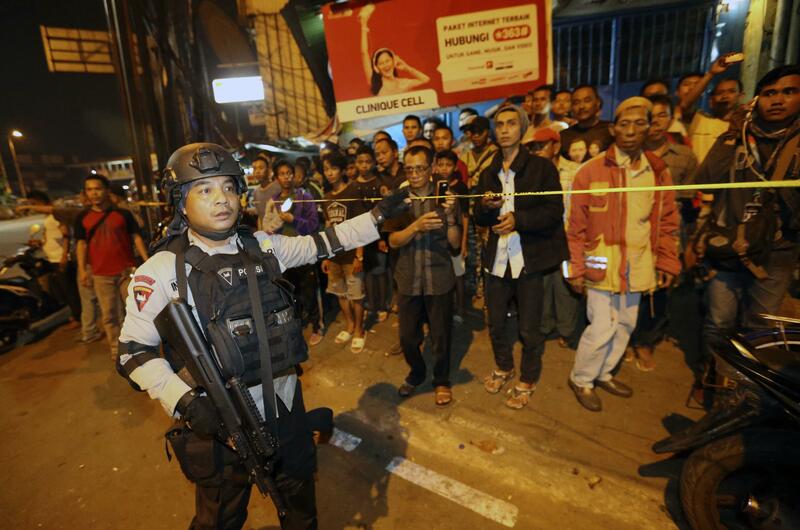 Wed., May 24, 2017, 9:51 a.m.
JAKARTA, Indonesia – A suspected suicide bombing near a bus terminal in Indonesia’s capital Wednesday night killed a policeman and injured four other officers, police said. Vice National Police Chief Syafruddin, who uses one name, said an initial investigation showed that the suspected suicide bomber also died in the blast. “Tonight, to Indonesian citizens and all of us who are here at the scene, I express very deep concern. A bomb explosion has occurred and for now it is believed to have been a suicide bombing,” he said. He said the officers had been guarding a parade by a group of local people. The explosion occurred in a parking lot next to the bus terminal in the Kampung Melayu area of eastern Jakarta. The injury toll was unclear, with broadcaster TV One reporting that two civilians including a female student had been wounded. A police bomb squad was investigating the explosion. TV channels showed people helping a victim lying on the ground and three policemen carrying another victim away from the scene. Indonesia, the world’s most populous Muslim country, generally follows a moderate form of the faith. Published: May 24, 2017, 9:51 a.m.